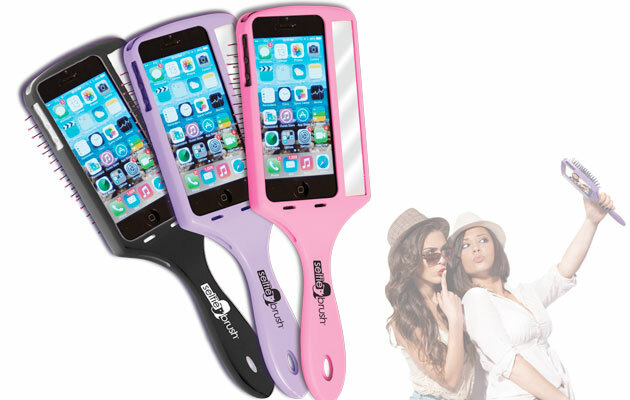 The Selfie Brush Is The Pinnacle Of All That's Wrong With Humanity | OhGizmo! Well, that’s a bit of a hyperbole right there we suppose, especially in light of a rampant ISIS and growing tensions in Eastern Europe… But to find out about the existence of a hairbrush/iPhone case hybrid does sort of highlight where our priorities seem to lie, here in the first world. You can apparently now safely ignore what’s going on in our planet while de-tousling your hair using a brush that also holds your iPhone. Yes, the Selfie Brush even has an integrated mirror, so you can do some final touchups before you go ahead and snap that pic, because well, the front-facing cam on the phone apparently isn’t good enough. Right? Whether or not this $20 accessory sells is not even the point, now. Someone, somewhere thought it was a good idea to invest some time and money making this, and that alone speaks volumes.